Electronics Costs > How Much Does a Slot Machine Cost? How Much Does a Slot Machine Cost? A slot machine will often have three or more reels or a video screen, which is spun when either the slot lever is pulled or a button is pushed. On average, plan on spending anywhere from $200 for a novelty slot machine to as much as $3,000 for a higher-end model of a working slot machine, similar to the ones you see in a professional casino. This would be the price for those who are interested in buying a second-hand slot machine for their own entertainment purposes at home. However, if you’re talking about what a casino pays for a slot machine, the costs could be much more. Experts have noted official casino slot machines can cost as much as $20,000. For instance, this article claims that Bally sells its machines for $9,671 each. The costs, in the end, will come down to the manufacturer, the quality of the hardware, the intellectual property it represents and title. Calvinayre.com, on the other hand, says the average IGT game sold for $13,000 in 2013, while another manufacturer, Multimedia Games, received over $18,000, on average, from its machines. 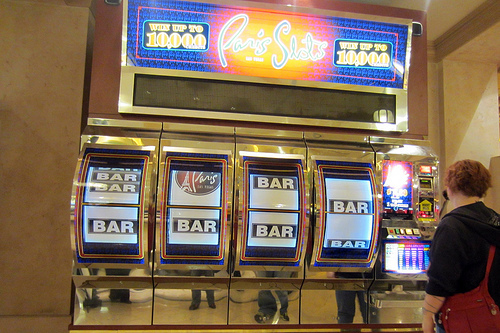 Generally, there are two common types of slot machines: a mechanical and computerized. When slot machines first hit the market, all were mechanical, operating gears and levels. Eventually, as the time when on, these gears were replaced with an electric slot machine which used motors and solenoids to run the gears. Today, most slot machines will use a computer to general a random number to generate the slot machine’s outcome. Repairs, depending on how much the slot machine is going to be used, needs to be factored in. Some machines can be more difficult to repair, whereas some machines will rely on a battery, which, over time, will need to be replaced as well. Even if the machine isn’t used for a long period of time, the battery may need to be replaced. A common problem for slot machine owners, according to this eBay guide, is a lost door key. If this were to happen, you will either need to hire a locksmith, purchase a new one for $20 or so or learn how to drill and barrel the locks. Due to the size of a slot machine, freight shipping charges may apply. There are legal implications if you’re thinking about buying a slot machine. In 41 states, it is legal to own a used slot machine, but in nine states: Alabama, Connecticut, Hawaii, Indiana, Nebraska, New Mexico, South Carolina, Tennesse and Wisconsin, it is 100 percent illegal. In 17 states, there will be a law that the slot machine must be, at a minimum, 25 years old. With all of that being said, check your state laws to make sure it’s legal to own. If you do not mind buying used, this can save you upwards of at least 50 percent. Try to explore the used inventory before buying new.